Check out the last announcements and news about our support group. 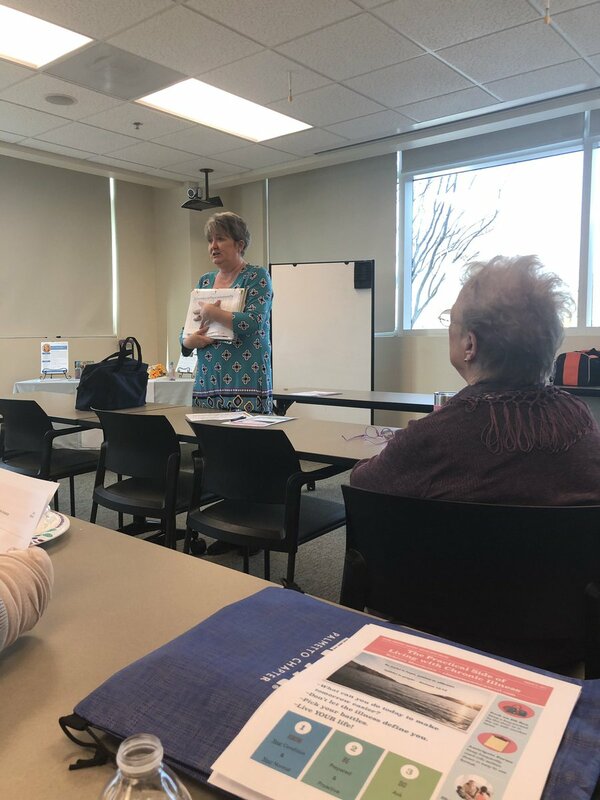 Greenville, South Carolina -As a part of Upstate Monarchs' Lymphedema Awareness month, we had a great fellowship in our community meeting as we heard from inspiring speakers talk about dealing with lymphedema & other chronic illness. The Meeting was held on March 12, from 5:30 PM to 7 PM at the St. Francis Millenium Coummity Center and was attended by 20 members. Dinner was provided by Bon Secours St. Francis. Our topic was "Living with Chronic Illness and Lymphedema Self-Care,". Speakers were Jennifer Massey, MSW, LISW-CP. She works with a group called "Warriors for Wellness." In this group, participants gain support and skills to care for their body, mind, and spirit. Our other speaker was Rebecca Messmann, who is the daughter of and caregiver to a Monarch member, Peggy Snyder. She presented real-life strategies for living with lymphedema and the preparation she does to ease the stress of emergency situations. Thanks to Rebecca, Peggy, and Jennifer of Spring Mill Ministries for sharing their wonderful message of coping. Greenville, South Carolina - After a very successful March Community meeting, Upstate Monarch's is announcing our next three (3) dates to put on your calendar so that you can plan to attend our meetings this year. We have been having great attendance this year at the St. Francis Millennium Campus. We hope many of you will come and take part in our meetings. Please RSVP so that we can get a good count for meals and refreshments. The topic will be "Healthy Living, Healthy Eating Habits." Speakers, Alison Lively, and Alicia Bliss, from Creative Living Wellness, will address the group. Lunch will be provided. Our annual Holiday Mixer will continue to be at the end of the year. All members and past speakers at invited to attend. Refreshments will be served. There is not a requirement to pay dues to attend meetings, but we do ask that regular members pay $25 dues per year to defray the cost of advertising, speaker expenses, and providing food. Thank you so much for your support. Checks may be made out to Upstate Monarch Lymphedema Support Group and given to Debbie Smith, our Treasurer. Greenville, South Carolina - Upstate Monarchs has rescheduled tonight's UM Holiday Mixer to January 22, 2019 and re-themed it as a New Year's Mixer for 2019. Normally scheduled for December, we decided to move the mixer due to the aftermath of the Winter Storm that hit the area this weekend and continue to have dangerous driving conditions at night. We're inviting all Upstate Monarchs members and past speakers refreshments at the January mixer as we celebrate the New Year and announce the 2019 schedule of community meetings. Greenville, South Carolina - Betsy Wilson, an original member of the Upstate Monarchs, passed away early morning on September 2nd as she wanted - at home, surrounded by people who love her. Visitation to follow at the church. Greenville, South Carolina - We want to publically thank Bon Secours St. Francis Health System of Greenville, South Carolina, for their generous sponsorship over the past 18 months. In that 18 months, we have made significant change and growth in our membership in the Greater Greenville area. The sponsorship includes funding refreshments and providing a meeting location, Millennium Campus Community Room, for Upstate Monarchs' Quarterly meetings for Greenville Community. UM has sponsored several meetings in 2017 under this arrangement and as we look forward their continued support for 2018 and beyond. Greenville, South Carolina - Our next Greenville Community meeting will be Tuesday, March 13, 2018, from 5:30 p.m until 7:00 pm. The meeting will take place in the Community Room at the Millennium Campus of St. Francis Hospital. A meal will be provided by our sponsor, Aeroflow (https://aeroflowinc.com). The speaker will be Kim Neel, Owner of Alala Company, a compression/mastectomy boutique in Columbia, SC. She is a breast cancer survivor, a lymphedema activist, and she will update us on the progress of the Lymphedema Treatment Act. As a one-year breast cancer survivor in 2006, Kim left the corporate world to open Alala, LLC with her fellow Girl Scout leader, Sherry Norris. Besides being an active Girl Scout volunteer, Kim has been a Team Captain for the First Ladies Walk – Steps Against Cancer and Relay for Life not realizing the research money raised would someday benefit her. With her bachelor of arts degree in business administration from Lenoir-Rhyne College, Kim went to work for Pirelli Cables and Systems NA. After 21 years at Pirelli Cable and 5 years in insurance, Kim left the corporate workforce to get certified as a post-surgical breast prosthetic, compression garment and cranial prosthetic fitter. Kim stands ready to serve women from all walks of life at “The Unique Boutique for Today's Surviving Woman”. Introduced in Senate on 3/02/2017, Lymphedema Treatment Act (HR930/S497)‏ amends title XVIII (Medicare) of the Social Security Act to cover certain lymphedema compression treatment items as durable medical equipment under Medicare. Greenville, South Carolina - Upstate Monarchs of the Upstate of South Carolina is sponsoring a Lunch and Learn event on Tuesday, September 26th at 12 NOON to 1:30 PM at the Bon Secours St. Francis Millennium Community Room. That room is located 2 Innovation Drive, Greenville, SC 29607. The Lunch event is provided and will feature two prominent vendors, Medi USA and Tactile Medical, who offer product to enhance the lives of those living with Lymphedema and similar conditions. This is fall meeting for the Greenville Community of Upstate Monarchs which has moved to a quarterly meeting schedule. We are asking any interested caregivers, patients, and healthcare professional to join us at the event. You can RSVP by send email to contact@upstatemonarchs.org before September 24th. Greenville, South Carolina - Yes, we are in the middle of Summer but we have set our Community meeting for the Greenville area for September and December. We will set a date for our Business Meeting (Elections) at later in November. Please put these dates on your calendar for the next activities for our Lymphedema Support Group meetings. Representatives from Medi & Flexitouch will be our speakers. We so hope that you will be able to attend these events. Greenville, South Carolina - Please save the date for our next Lymphedema Greenville Support Group meeting and put this event on your calendar. The event will be held on Thursday, March 23, 2017, at 5pm, at the St. Francis Hospital Millennium Campus. We are so fortunate to have another well-respected physician speaking to our group regarding lymphedema and treatment options. Read his website to learn about him. Your questions and concerns will be addressed and you will meet other patients and caregivers with a similar concern. Refreshments will be provided so come join us as we start 2016 with our first community meeting in Greenville. We have some wonderful news from this summer to share. As a result of the showing we had at the last Greenville Community meeting with Dr. Lisa Darby, we have gained the financial sponsorship of the Bon Secours St. Francis Health System for the Upstate Monarch’s Greenville Community meeting. This means that St. Francis will be an ongoing sponsor and will provide food and a possible new location for our Greenville meetings. We will be enjoying that option next month as we hold our next meeting of the UM Greenville Community on September 22nd. Our topic will be about Lipedema, a condition with similar treatment options and methods with Rebecca Griffeth. An announcement will be release about this meeting for more details in the near future. I am very excited for our group to have this opportunity to expand our reach and upgrade to better amenities. We are hoping this support will help us take the message of active treatment and caring support discussions about Lymphedema and its related conditions to more people in the Greenville Area. I hope this news can open a new approach to how we support of our Community Meetings across upstate. With our Anderson Community already enjoying a wonderful partnership with the Anderson Cancer Association and this generous sponsorship from St. Francis with our Greenville Community, we will look to continue this momentum in the next few months. These opportunities may mean we will make some changes to our group schedule and meeting locations, but I promise we will continue to keep our mission to support and advocate for our communities in the forefront. Of course, we want, and need, your feedback and assistance as we explore those opportunities together. I hope you had a great summer and we look forward to seeing you on the 22nd!